One of the biggest problem a Tally user facing is changing invoice numbering and restart it from new financial year. 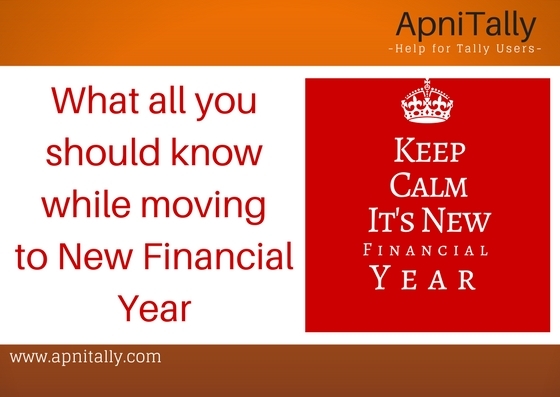 ApniTally has received many calls related to this , so here is a quick post on how to restart your invoice numbering while moving to New Financial Year. The numbering of any voucher is decided from voucher types. 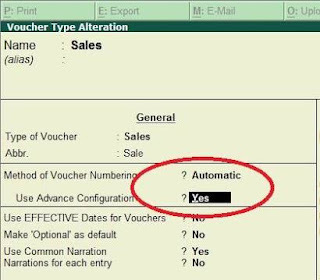 So if you want to change the numbering of sales voucher then you have to go to sales voucher type and Alter it. So go to Accounts Info and then Voucher type and then Alter and select Sales Voucher. Now go to Advance configuration just below voucher numbering. Set it to yes and you would get new screen. Now restart numbering column just give the date as 1-4-2018 and starting number is 1. That's all you have to do. Your numbering would start from one. One more smart thing can be done is adding something before numbering or something after bill numbering. For example instead of having plain bill numbers like 1, 2 ,3 etc you can have 18-19/1 or AT/18-19/1. If you want this then you go to prefix column and add date as 1-4-18 and add 18-19/ or AT/18-19/ in this column. Your new style of numbering is ready. If you want your numbering as 0001 instead of just 1 then mention the width of numeric part as 4 and show zero before numbering as yes. This style would also be added. Hope this small tip would help you in restarting your invoice numbering in your New Financial Year. As the new financial year is round the corner, there are my questions and doubts in minds of accountants as well as Tally users. As the new financial year approaches the activities increase the business world. Many think of moving ahead in new financial year, while others think to shift from manual accounting to computerized accounting. 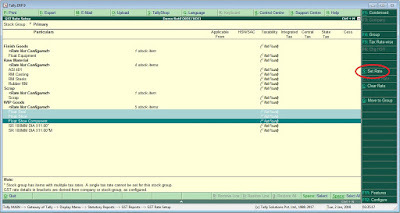 As a user of Tally software few thing which comes up in the mind of people and their possible solution would be discussed here. First thing which comes in mind of a Tally users during this period is, "Should I create a new company in new financial year to continue accounting?" This thought comes due to many reasons. One them is that we think new financial year should start in new company as this would ease the work. Old troubles with company data would be left behind ans as the company created is new the entries would be faster in new company. But this is totally a wrong approach unless and until you want a complete new fresh start. This start would be in form of creation of new company or new entity etc. Or you may be just starting your accounts on computer. Otherwise we should never create a new company in new financial year. The solution is just change the financial year to the next one in Gateway of Tally screen by pressing Alt + F2. The complete problem and the solution is discussed by me few years back in this link. Starting a new financial year : Is it time to create a new company? The second issue or question which comes in the mind of accountant is to start separate accounting on new financial year and they want to do it by splitting the company. The reasons may be that they think they should not carry the burden of last year problems to the new year. The process of splitting a company is explained here. Third issue a Tally user faces is of Invoice numbering. As he moves up to new financial year he may face duplicate invoice number issue. As in new year invoice numbering starts with 1 and in previous year too it was one , it would give error if you are using bill wise bill referencing in Tally. As you may have created a ref. of 1 as the bill number is default ref number used by Tally you can get error message for same bill reference no. as 1. To avoid this problem you should use bill number prefixed by or suffixed. If you have decided to move to computerized accounting in new financial year then you must be having some questions.You can read this article by Tally on How Computerization can help you in GST regime. You may be having some fears also, like the biggest one is I don't Know how to operated computers. I don't know the software. I don't have knowledge of GST, Who can help me out etc. Here ApniTally is here for help. We would give you software as well as help to manage your accounts. It includes free training to work in Tally as well as how to generate GST Reports. Leave a comment below if you need any kind of help for starting your new financial year in Tally. In the rapidly changing GST scenario people are running here and there for being GST Ready Some are fence sitter while some have made decision to get digitized. Getting software is one thing but getting proper support is another one. 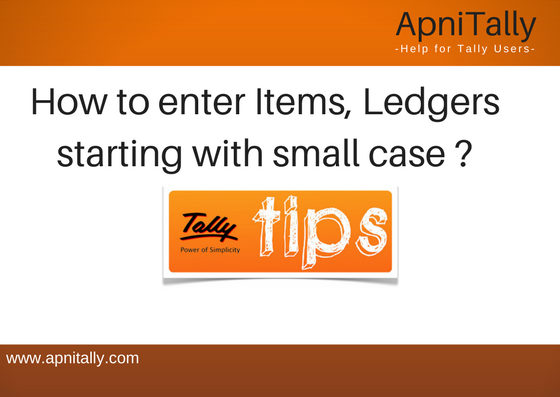 Many of ApniTally users have approached us for getting proper support for Tally. 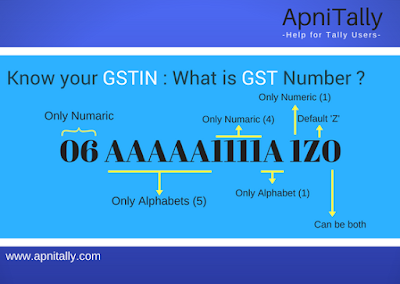 Till now ApniTally has limited itself in helping Tally users via written Tally articles and tips but now keeping in view the headache customers are feeling related to GST we have offered free support also but with certain conditions. 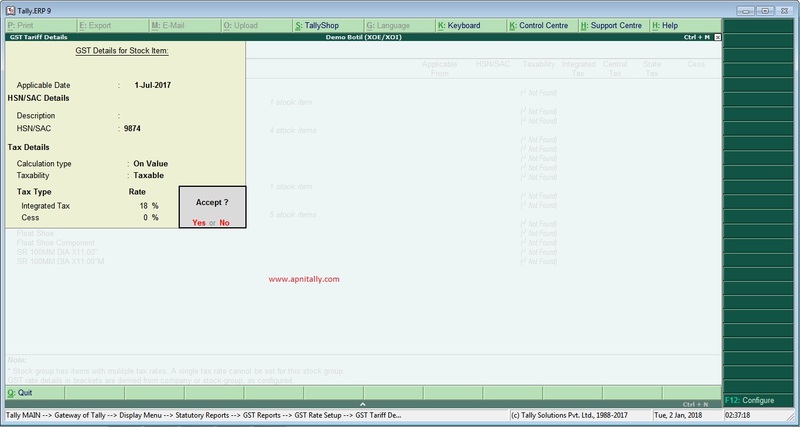 ApniTally is offering Tally Online and free support with it for new Tally users. If you are getting any difficulty in being GST compliant or are deciding to go digital in coming financial year then ApniTally is here for your help. Here is the procedure to get your Tally software. Download the Tally from this link. Buy the licence online from ApniTally. Once you buy via the link above we would get notification and would get in touch with you. ApniTally would activate your licence by taking your system online via remote access, download the team viewer form this link. It's free for personal use. Hands on training on How to create GST ready sales bill using Tally.ERP 9 rel 6.4. How to quickly enter your purchase entries. How to enter payments and receipts bill wise bill. You get phone support from ApniTally although you are entitled to get support from Tally company itself. But if you have purchased from ApniTally we would be pleased to offer you telephonic support. You would get online remote access support using Team viewer on 50% discount. Have questions regard this ApniTally plan? Just give us your Name and Number, we would get in touch with you soon. 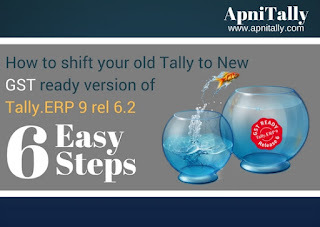 Tally.ERP 9 rel 6.4 is here with truck load of new features including e-way bill. The much awaited new release of Tally.ERP 9 is now online. As the country is going to embrace e-way bill system from March 7, 2018, it can be seen as major relief from customer point of view. Now people using Tally.ERP 9 can raise the invoice and Tally would tell them instantly about the need for e-way bill no or not. 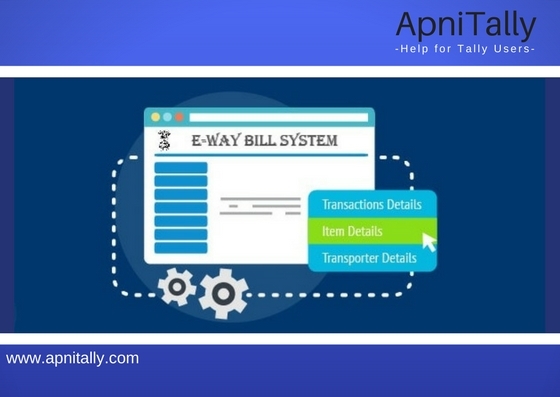 Tally would prompt the user to fill the required information required for e-way bill, while raising an invoice. In addition to e-way bill system, many more features have been added including GSTR-1 format change and GST compliance for composite dealer. Let's see the changes in detail. On Feb 20, govt. made changes in GSTR-1 format, which were incorporated by Tally very quickly. These changes were in excel offline utility, CSV format as well as in JSON format. Now monthly GSTR-1 can be filed easily without any hickups. 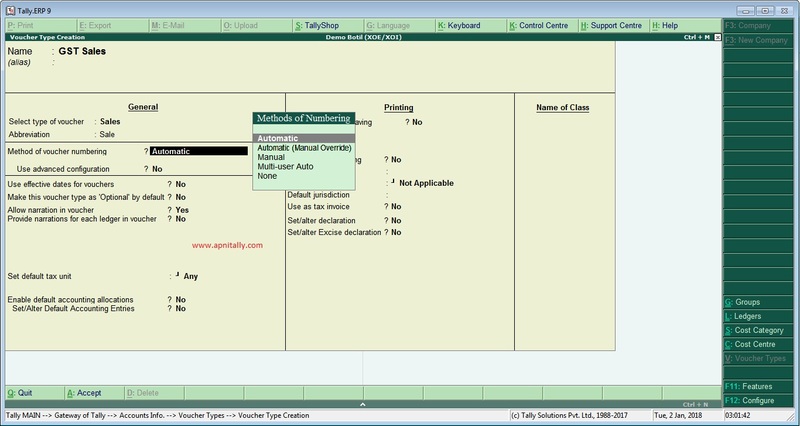 Tally captures all the information needed for generating e-way while raising an invoice. You need not to copy paste the details once again in the portal. 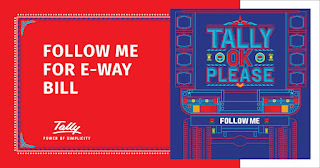 You can print the e-way bill no on the relevant invoice easily, take a printout and hand it over to the transporter quickly. Single invoice as well as multiple invoice can be exported in json format for e-waybill to be generated. If vehicle no, place of supply, mode of transport are same for a set of invoices then invoices can be grouped and single json file can be made. e-way bills can be generated on behalf of supplier or transporter. The GST compliance for composite dealer has been incorporated in rel 6.4. GSTR-4 return in json format can be exported and directly uploaded to GSTN. In addition to this product enhancements related to GST transactions, GST reports, Accounting vouchers, Inventory management and accounting vouchers has been done. If you need Tally software and training on GST and e-way bill then just fill this form we would get in touch with you to help you out. 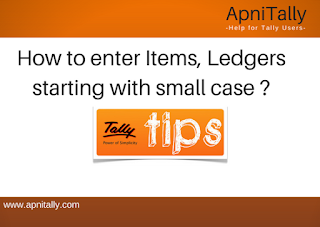 Tally Cool Tip : How to make items, ledgers etc starting with small case ? Today i am going to share a small tip which is very cool too. As we all know that Tally is known for it's simplicity. The simplicity can be seen by the facility that usually people are not well verse in writing in case sensitive type. or example we find it hard to capitalize the first letter of every word and it takes special effort for those to type who are not good at typing skills. And most of the accounts guys are not typists. So to simplify Tally automatically makes the first letter of every word Capital automatically so that it doesn't look bad. Like ledger name "Global Supplier" would be written as it should be written, first letter capital and not as "global supplier". But this simplicity becomes difficulty some times. In today's internet age we find names like e-way, iPhone, iCare Services, eVision Networks more often. The problem begins when you have to enter the name which really starts with small letter. for example if you have to add an item say iPhone or enter a company who has name as iCare Systems etc., then in Tally it would automatically become Iphone. And you you would get puzzled that how to write it as iPhone and not Iphone. My today's tip is related to this only. Howto make first letter of any master in Small Case in Tally? The answer is very simple and short. When you in any master creation screen, just press Shift + F3 and now the case is changed. Now you enter anything and it would be in small letters. It would not be automatically changed to capital letter. You would be able to write iphone. To make P capital just type it by pressing shift key and you would be able to write iPhone in your list. Check out this small video about this tip. You can find lots of more such Tally Tips on ApniTally. GSTINs are the main constituents of any GST returns you prepare. You can say that they are the very basis of filing correct GST return. The errors in filing GST return due to wrong GST numbers can be reduced if we have some idea of how GST number is defined and what are the rules which guides in defining a GST number. We usually get GSTIN of the clients via phone or via some hand written note and we fall prey to errors while quoting the wrong GSTIN. So the right way to take GSTIN is by email in well printed format so that there is less scope of error. Otherwise we would hear P as G or E over the phone. Lets see this with this sample GST number in the graphic below. Here even after giving Printed format you can get confused if the first and the last digits are 'Zero' or 'Oo' and the third last digit is 'One or' 'i'. But if you know the simple structure how GST number is being designed then you can reduce the chances of errors. The first thing in GSTIN is its structure which everybody should know is that every GSTIN have three parts. You would notice that first two digits are always numeric and they should be as they are the code of state as per Indian Census 2011. 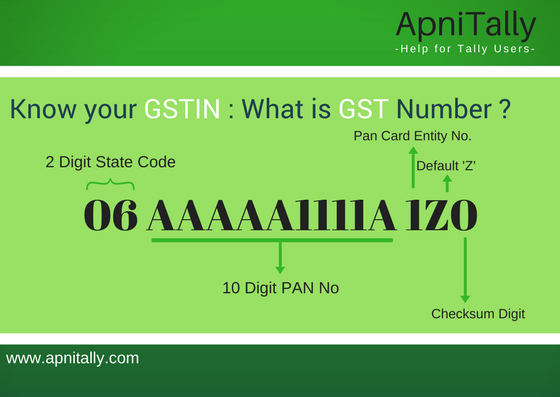 So while entering GST Number it should be kept in mind that 'zero' in first or second digit cannot be 'O'. As the first two digits would be numeric only. Second part is 10 digit pan number. If you have PAN number of the party then it can be verified by these ten digits. The most unique thing in this part is that it can be divided in three parts. First part is 5 continuous Alphabets, then second part is 4 continuous Numeral and the third part is one Alphabet. So if you are noting down GSTIN then you can counter check that anything in these five digits written as O is actually Oo and not 'Zero'. Know your GSTIN, the structure. The third part consists of three digits. 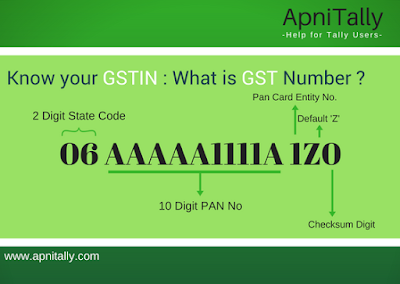 The first digit is numeric as it denotes the number of GST number a particular PAN Card is having in a state. 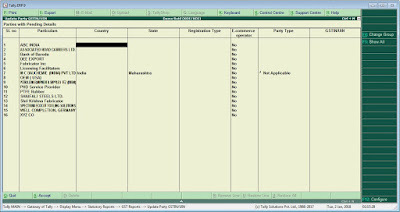 Suppose if a PAN card has two registrations then it would be 2, but in most of the cases it would be 1 only. So another thing which can be sure of is that this would b numeric only and not the alphabet. So the confusion between 'i' and 'One' can be removed by just looking at it. The second digit is always 'Z' as it has been set by default. But it would be always Alphabet only. The third digit is actually check some digit which dependent on whole combination of previous digits. And this digit can be both numeric or alphabet. The confusion about this can be removed by Tally itself. You must know that Tally itself have the logic the determine if certain GSTIN is right or not. 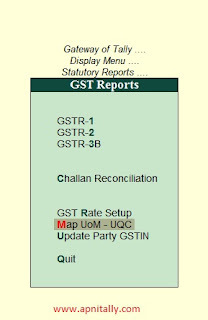 This facility to check the GST number correctness is provided in rel 6.3 and later. The moment you would enter a GSTIN in the field provided by Tally it would give you a warning if it is wrong. The beauty of this feature is that it need no internet to detect correctness. Whereas it would not tell you that if the mentioned GSTIN is of the same company or not. If you enter right GSTIN of a wrong party then it is going to accept it as the format and logic is correct. So be careful. Happy New Year 2018 : The GST year Ahead !! 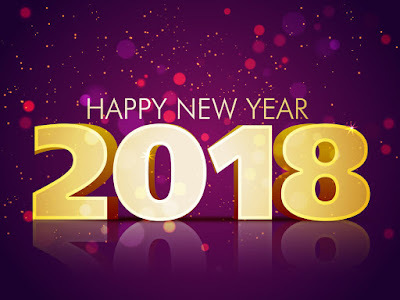 To all the users and admirers of Tally, ApniTally wishes them a very Happy New Year 2018, I pray that new year brings new opportunities and hopes to you and May God give you all the power to realize your goals in coming year. The year 2017 was very eventful for the business community as well as the users of Tally. It was such an eventful year that I could not spare time to write on GST and other development going in Tally software for my beloved readers. We were so busy in helping out the users of Tally on the ground that we could not get enough of time to spare for our online admirers. The coming of GST and the later development in its journey, many changes were seen by Indian businessmen as well as common people. The journey saw many ups and downs. Some times technical glitches led do increasing dead lines for filing and some times elections led to ease some norms. These changes are going to happen in the coming year too but now the journey of GST would be little bit more smoother. In the year ahead we are going to see the complete bill cycle of GST which would ease the life a little bit. Earlier in the month of December GSTR -2 was seen as the next big hurdle as well as big test for GST council but this test has been delayed. Now the bigger challenge is e-way bill which would be implemented from Feb 1, 2018. And in March we may see the full bill cycle of GST. The dampening effect of demonetization has now ceased and the hustle and bustle of new tax regime is also settled down. Now India would see a growth trajectory in year 2018. We can hope to achieve around 8% growth and the GST would be the vehicle. Tally has also traveled the GST journey with India. Helping users of Tally in GST journey was the biggest challenge for Tally which Tally managed successfully with introduction of new help channels for its users. In addition to existing help channels another channel of blog was introduced, which now has become defacto guiding resource not only for GST concepts but also for Tally users. Newer and newer functionalities were being added with Govt. clearing doubts about it's procedures. The first mile stone of this journey was GSTR 3B. It was achieved very smoothly and Tally users filed their GSTR 3B with Tally. 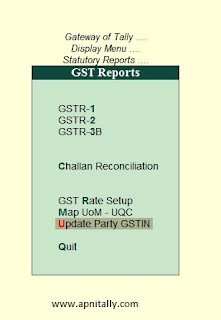 Now the latest release of Tally.ERP 9 rel 6.3.1 is handling GSTR1 as well as GSTR3B very efficiently. You can create JSON files with rel 6.3.1 of GSTR1 and GSTR 3B. You can see why you need to download the latest rel here. The facility to file GSTR2 is also being provided which would be helpful in near future. Overall year 2018 is going to be a very exciting year for all of us Tally lovers. If you have recently shifted your Tally company to newer version, then this article would help you to make your company GST ready in just few minutes. As your old company would be in 4.93 version of rel 5 version it would not be GST compliant, so when you would sift to new GST compliant rel 6.x then it would make certain changes in your company and you should know about these changes. You should be ready by this time on further steps to be taken. Step 1 : Setting GST No. Enable GST to Yes. And then set alter GST Details should also be Yes. Now it would give you the option the enter your GST No. Here one interesting factor is that Tally would validate your GST No., if you put wrong one due to some mistake it would give you the warning. Step 2 : Put all Party GST No. at one go. 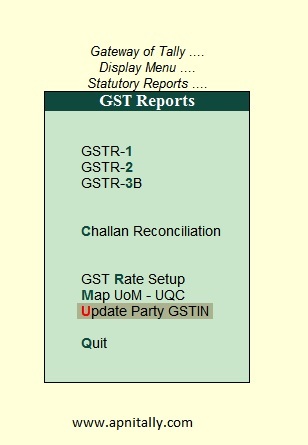 You would find option Update party GST no. You would see screen like this where you have to define the country, State and type of registration and his GSTIN No. If you don't remember all the party GSTIN then no need to worry, just update the one you have with you. Next time when you would come to this screen you would find the remaining ones only. Next step is the map your Unit of measure with Unique quantity code of GST. 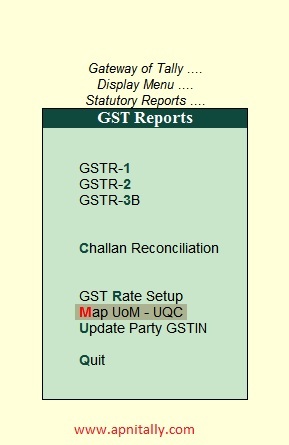 Here we have to map the units which we have defined with already existing code provided by GST Network. As your old company would not be having GST ledgers, now it's time to define them. You need only 5 ledgers, namely, Sales ledger as Sales of Goods or Sales of Services, the Tax Ledgers namely Central Tax (CGST), State Tax (SGST) and Integrated Tax (IGST). Be sure that no tax rate should be defined in these ledgers. Generally we define the tax rate which would make GST working very difficult. We may be having a habit of defining tax ledgers like we you to do in VAT regime like sales 5 % , VAT 12.5% etc. Here we don't need such ledgers. This is an optional step. It is suitable if you start GST billing with a new series. New series can be started by creating a new voucher type namely GST Sales. This voucher type would be sales type voucher which may have new series. By doing this you can do entries upto 30 June in your normal sales voucher and after that it can be done in GST sales voucher. In case if you have to add some remaining bills before 30 June you can do. Now your company is GST ready. Start making GST Entries. IF you have any queries in this process you can as them by commenting on this article. I would be pleased to help you. How to get Highest Compliance rating in GST and Maintain it in Easy Steps. how many are you fulfilling. The beauty of this rating is that even smallest businessman can get the highest rating as well as bigger business house may get lower rating. All depends on your dealings done on GSTN portal. One of the biggest reason of introduction of compliance rating in GST was to safeguard the businessmen from fraudulent practices. As your rating is visible to all the parties your are dealing with it would warn them whenever your regularity is disturbed. It would work both way. You too would get warning on reducing rating of your vendors. There is a fear among businessmen about maintenance of this rating. And that fear is that only business with enough resources can maintain his rating but his is not true. Everyone can maintain it. Here are some tips to maintain your rating to the highest. You should never miss any deadline of GSTN portal, you should be extra vigilant about it. For example the first deadline comes on every 10th of the month to upload your GSRT-1. This is most vital. After that the 15th and then the 20th of the same month. These should be never missed. To resolve this issue you can depute a dedicated person for this as you may not get time every time every month on these specific dates. This is another area which can reduce your rating. You should fill all details of your invoices which you have to upload in GSRT-1. The amount figure in invoice should exact match of all your invoices, All inventory details should be perfectly entered. Mismatch of invoices would decrease your rating. Dealers who miss their deadlines would eventually decrease your rating too. As they would not file their taxes on time then your claim for input would also disrupt and it would decrease your rating. As it is clear in GST that you would get your claim only when your seller has paid tax, if he misses then your claims would also go false, which would decrease your rating. This could be your weakest link. GST compliant software is a must. You should opt for that software who can do matching for you, who can help you prepare error free returns for you. Even if you make errors it should be able to rectify them before final submission. It should assist you in paying your taxes too. 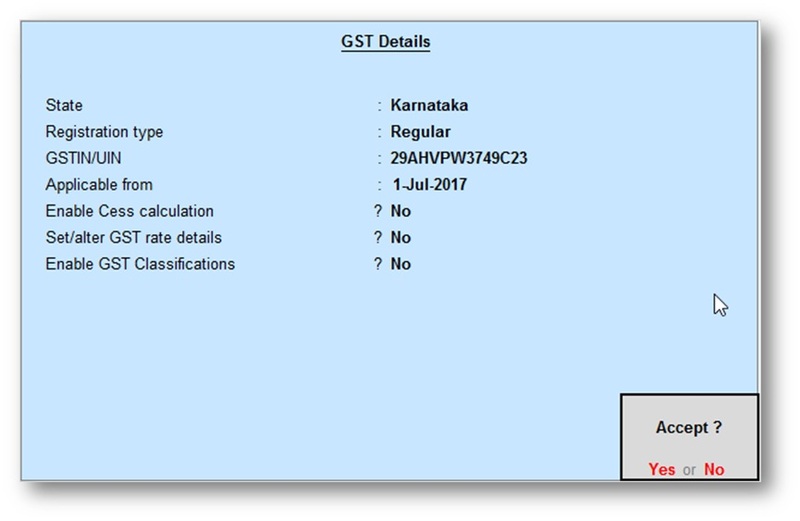 GSTN portal has one more link which is of GSP, i.e. GST Suvidha Provider. Initially GSTN portal would give you a utility to validate your data but later on you would need a GSP would would filter your data before sending it to GSTN portal. So your application software (ASP) should be well harmonized with your GSP. It should seamlessly connect with GSTN portal. Tally is one such software which is fully GST compliant as well as Tally solutions are GSP. 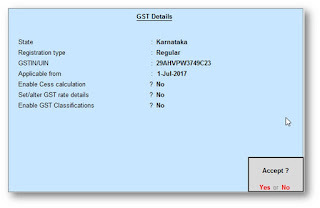 So if your application software is Tally then being GSP you can seamlessly get connected with GSTN portal. Another reason one should go for Tally is that it's trained manpower can be found easily. All the readers of ApniTally can get Tally software Online through Debit card or Credit card which is backed by ApniTally it self in support. Our team would help you in installing and providing you much needed GST training for filling your GST returns through Tally. GST is round the corner and all the traders are having their fingers crossed for what would happen to their business what rules would come and how invoicing would be done etc etc etc. While some people are ready for GSt but some have still doubts on what to do and how we can be GST ready. Ignorance can lead to pay heavy price,so it it better to be prepared before hand. Here is the step by step guide to be GST ready. 1. Get Complete your working for Closing Stock for the period 31.3.2017 / 30.6.2017 before GST Implementation date. 2. Allocate your such stock into quantitative mode. 3. Get the A/c Statement from your Suppliers / Creditors for the year ended 31/3/2017 & compiled them from your books. 4. Rectify *Mismatch Reports of Purchases *, if persists . 5. Revise your Vat Returns if point no.4 applies to you. 6. Make strict follow-up to Collect all the C forms/H Form/ I forms. 8. Make a separate file of those items which are shown in your Unsold stock as on 30.6.2017 e.g. Purchase Bills/ Bill of Entry/ Excise Paying Documents etc. 9. Stock ageing be made to ascertain if any stock is more than 1yr old. If yes then dispose it off immediately or sell it to your sister concern against Tax Invoice locally. 10. Classify stock tax rate wise, purchased locally to get ITC into SGST. 11. Classify stock purchased on invoices bearing Duty Payment & non duty payments to get ITC transferred to CGST. 12. Inform your GSTIN / ARN to all suppliers of Goods & Services. 13. Obtain GSTIN of all Suppliers & Buyers. 14. Apply for migration in all states if you have centralized registration under Service Tax. 15. Train your accountants for GST accounting and returns formats. 16. Make Chart of HSN CODES & GST Rates on your goods & services to be purchased & Sold. 17. Check whether any stock of one year old is lying with you . 18. Analyse P and L and see which expenses are liable to RCM. 19. Be in regular touch with your GST Consultant . 21. If you are planning to generate , invoices through any Software , do align with Software Consulting firm. ApniTally can provide you all help in procuring Tally and smooth migration to GST. You can Buy Online and ApniTally would provide you all support. 22. And Get approved the Draft ( pt no. 20-21) from your GST Expert. 23. Use only original Software for Accounting & Invoicing purposes. Tally is your best bet in GST as Tally is also a GST suvidha provider. 24. Pl pay special attentions for any Calls, mails , messages or communication of your GST Consultant/ Department. 26. GST / Interest/ penalty or any levy may be paid through RTGS/ NEFT/ Debit Card/ Credit Card Etc. GSTR 9. : 31st December of Next F.Y. 28. Penalty Provisions for non submission of GST returns : Rs 100/- per day but subject to max. Rs.5000/- in each acts. 29. Penalty Provisions for non submission of Annual Return is 0.25% of Annual Turnover . 30. Please Final the terms & remuneration of your GST Service provider before GST Implementation Date . 31. Option of revising the return is not available in GST Regime but you can modify your uploaded data by Debit & Credit Notes. 32. Every Normal Dealer filing GSTR 1 -3 required to submit Annual Return in GSTR 9 by the due date . 33. Late filing would be permitted on payment of late fees only. Hence late filing of return will not be possible without payment of fees. 34. A return furnished without payment of full tax due as per such return shall not be treated as a valid return for allowing input tax credit in respect of supplies made by such person. 35. Input tax credit is eligible only after filing a valid GST return. Here is a small preview How thing would be done in Tally.